The head of an Air Force Osprey tiltrotor squadron has reportedly been fired following the near-fatal crash of one of the unit’s aircraft on June 13. “The commander of the 8th Special Operations Squadron was relieved because of a loss of confidence in his ability to effectively command the unit,” Col. James Slife, 1st Special Operations Wing chief, told Inside Defense (subscription required). Slife did not give the squadron commander’s name, but an Air Force press release identifies him as Lt. Col. Matt Glover of Austin, Texas. Glover assumed command of the flying branch’s first Osprey squadron in May last year. His goal, he said at the time, was to “grow and improve the CV-22 force,” using the designation for the Air Force version of the tiltrotor. “The challenges of the 8th Special Operations Squadron’s demanding mission require new leadership to maintain the highest levels of precision,” Slife told Inside Defense. The implication is that the Air Force is attributing the crash to squadron procedures or the readiness level of its aircrews. The 1st Special Operations Wing’s public affairs office did not answer a phone call on Thursday morning. An email to the office also went unanswered. If confirmed, Glover’s sacking would make him at least the second tiltrotor commander relieved of duty since the controversial hybrid aircraft, made by Bell and Boeing, entered testing in the 1990s. 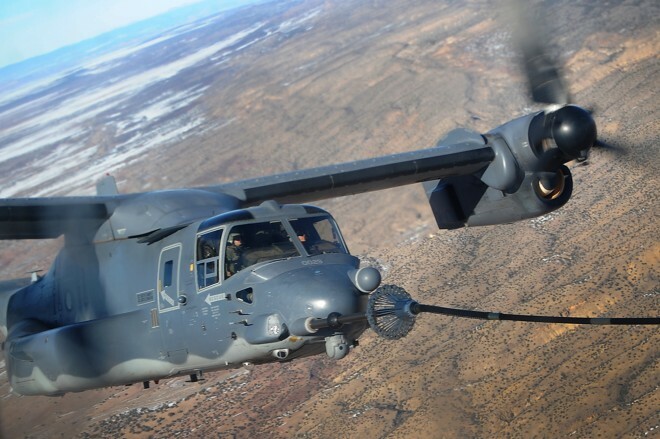 In 2001 the Marine Corps commandant fired Lt. Col. Odin Lieberman, head of the Corps’ Osprey training squadron, after Lieberman was accused of falsifying maintenance records in order to mask the tiltrotor’s design flaws. An early version of the V-22, which takes off and lands like a helicopter but cruises like an airplane, crashed four times during testing between 1991 and 2000, killing 30 people. Since entering frontline service in 2009, three of the Air Force’s roughly 20 V-22s have been destroyed or badly damaged in accidents, at the cost of four lives. Likewise, in the last 10 years the Marines’ fleet of some 200 Ospreys has suffered around a dozen major accidents resulting in several destroyed aircraft and no fewer than three deaths. The Marines, who tout the Osprey as their “safest tactical rotorcraft,” have used semantic games and fudged statistics to obscure the V-22′s true safety record. The V-22′s rotating engine nacelles are notoriously complex, its engines hot and over-powered and its aerodynamic qualities unforgiving compared to a traditional aircraft. Still, Glover’s firing at first might seem to absolve the CV-22 of any fault in the June 13 crash, which left the aircraft on its back and burning in a field north of Hurlburt Field, a major Special Operations Forces flying base in Florida. Five people were injured. Slife told Inside Defense that the cause of the accident remains unknown, but added that there was no reason to suspect a design flaw. But the Air Force has a history of blaming people even when its warplanes malfunction. The flying branch tried to pin the 2010 fatal crash of an F-22 Raptor stealth fighter on the pilot, Capt. Jeffrey Haney, even though the accident was clearly related to the F-22′s ongoing oxygen-system woes. When a CV-22 crashed in Afghanistan in 2010, killing four occupants, the lead investigator Brig. Gen Donald Harvel initially attributed the incident in part to engine failure. But Harvel said the Air Force brass leaned on him to blame the pilots, instead. With 37 people dead and at least two careers shattered, the controversial V-22, through mechanical failure or otherwise, continues to wreak havoc on its passengers, crews and commanders.